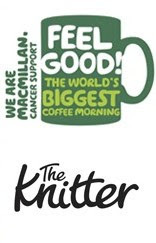 I belong to a knitting group called the ‘Barknitters’ (a pun on the word Barnet – not a reference to establishments serving alcohol) and we have decided to get inlvolved in the MacMillan coffee morning campaign which will take place on Friday 25th September. The Macmillan Comfort Blanket campaign is really gathering momentum and both Macmillan and The Knitter magazine are astounded at the response they have had from knitters who are getting involved, knitting squares, hosting coffee mornings and supporting by creating blankets to raise awareness of Macmillan's fuel poverty campaign. As well as producing blankets, the activity will also help raise awareness of the issue and hopefully encourage more people to register for a coffee morning, therefore helping Macmillan to provide services to even more people affected by cancer. Macmillan is supported by leading knitting magazine, The Knitter, and Rowan Yarns, who have lined up some of the biggest stars of the knitting world to design patterns for the campaign, including Debbie Bliss, Alice Starmore, Meg Swansen, Marie Wallin, Jared Flood and Teva Durham. All of the patterns are available as a free download from the Macmillan website www.macmillan.org.uk/theknitter, where people can also register for their coffee morning or make a donation. Rowan are currently in the process of receiving more 'designer patterns' which will be available on the Macmillan site in the coming weeks, including those by Kim Hargreaves, Martin Storey and Marie Wallin to name but a few. Rowan have also worked with Kirstie Allsopp to produce a square design which will be launched next week.